Comfortable living is expressed in this 4 bedroom plus studio Victorian house. 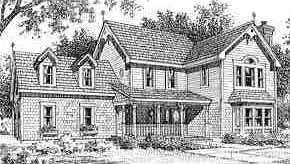 The delicate details, wood siding, curved shingles, bays, dormers and steep roof are characteristic of this style. Featured are the farmhouse front porch, the curved ornamental stair in the spacious foyer, heat-circulating fireplace in the living room, large glass areas in the family room and dinette, and bay windows in the kitchen and dining room. In addition, the second floor features two luxurious bathrooms each having two basins - the master bath also has a stall shower. The master bedroom is equipped with a walk-in closet and two additional closets. The house shows a full basement but can be built as a slab on grade if desired.